Doug Free sent this photo. I've attended Drum Corps International events over the past several years because my son's high school drum line would go to the drum corps event in North Texas. The shows for all the corps have been great to watch on DCI.org's EnCorps! Video – the Atlanta event was great. My favorite corps is clearly the Phantom Regiment, and I've got a solid reason why besides their level of play. My son, Robert, is a first-year member who plays the tenor drums. 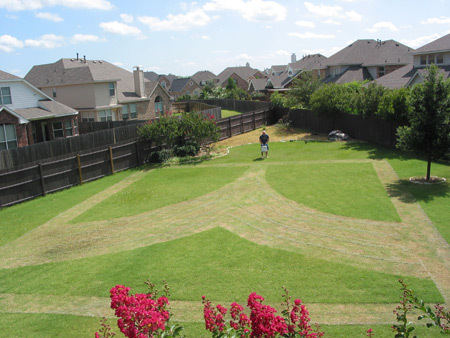 Since Phantom Regiment is competing in a Texas event tonight, I thought I'd express my support in my lawn in Highland Village, Texas.